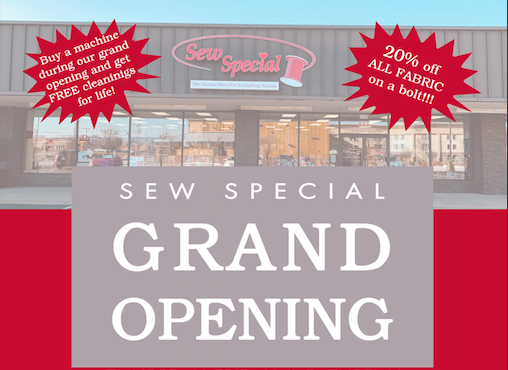 Grand Opening for Sew Special 688 W Main Street. 11am Ribbon Cutting with refreshments. Auction items for Fayette Friends of Animals benefit auction on display. FREE Scissor sharpening from 9-5pm, one free pair per customer. **Additional scissors can be sharpened for $5 per pair. Many quilted items and stained glass items will be auctioned off with all of the proceeds going to FFA in memory of Donna's sister, Grace Cromwell. This includes table runners, quilts, and 6 special sets consisting of a small quilt made by Grace and a matching stained glass piece made by Craig Eicher of Bunker Hill, WV. Fayette Friends of Animals will be on hand with some dogs and cats that are looking for "furever" homes! Come meet them and learn about the wonderful work this organization does for our county. Our Classroom will be set up to assist the children in making a 9 patch quilt block. Pre-cut squares, sewing machines, handouts, refreshments and friendly faces will be available to introduce the children to sewing and make it a super enjoyable creative experience! Cost will be $20 plus your materials. April in National Serger Month! Come on in and we will address any of your serger needs in a fun, low-stress environment. The possibilities are endless! Complete a serger project and receive guidance and support. Don't have a project???? Deb will have some fun and easy ones on hand. If you need a refresher on threading the serger, or need convert from overlock to cover stitch (or any stitch, for that matter) come on down! Bring your serger, manual and accessories along with any other supplies needed.